I made so much nutella the other day, I didn’t think we would ever finish it. So, I decided to add some to this delectable banana bread. 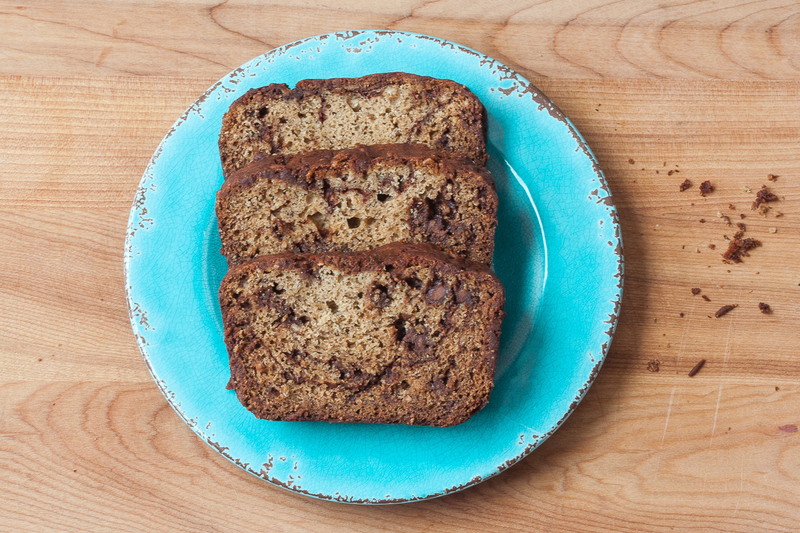 And who doesn’t love banana bread with chocolate chips and swirls of nutella! 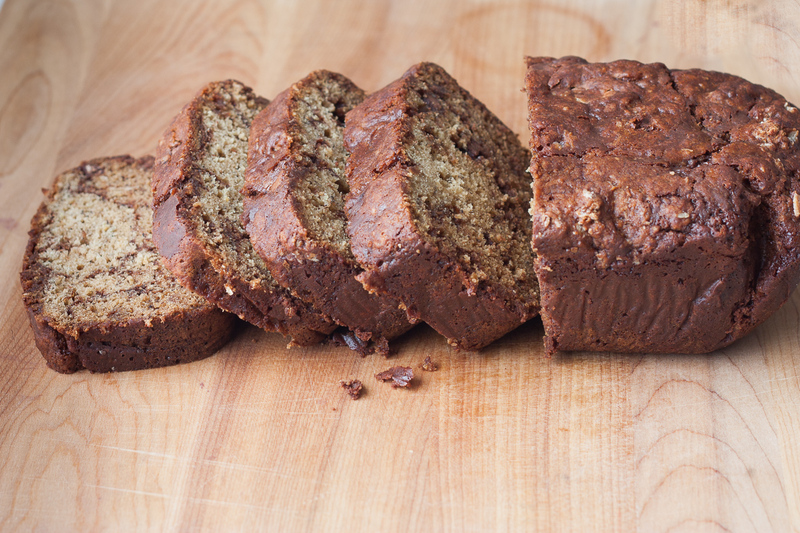 I have made loads and loads of banana bread – ever since I was a teenager. I actually won a contest when I was 17 for banana bread in our local newspaper and won some sensational kitchen flooring for my parents. I really wanted the silver tea set that the person one down from me won, but c’est la vie. My parents were happy. 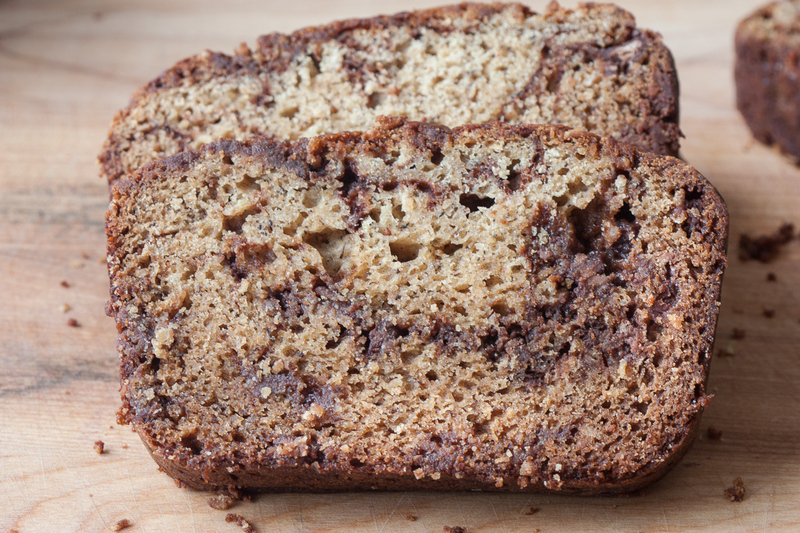 This Nutella Swirl Banana Bread has it all; moistness from the bananas; just enough sweetness from white and brown sugars and nutty aromas from the browned butter. And if you slice it up while it’s still warm, the nutella and milk chocolate chips will be warm and molten. Double yum! 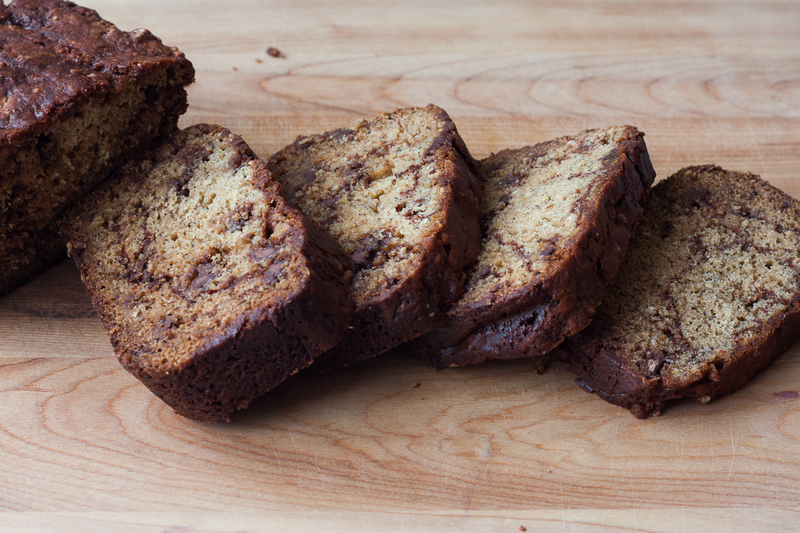 I made this Nutella Swirl Banana Bread with browned butter to amp up the flavour components. I have instructions in a previous post on how to brown butter, if you have never done that. It’s really easy, by the way! Some people like to spread butter on banana bread, and that’s ok, but this one is so loaded with browned butter and chocolate and nutella, I think it’s absolutely delicious on it’s own. It would be fantastic with a large mug of a spicy herbal tea or a chai latte. So good! Line two loaf tins with parchment paper. Brown the butter (see instructions above). Add sugar to browned butter. Once the egg and butter mixture has cooled, add in the eggs, vanilla, yogurt and bananas. In a separate large bowl, stir together the flours and baking soda. Add butter and sugar mixture to dry ingredients. Stir all ingredients together until mixed. Add about 1/4 of the mixture into each loaf tin. Spread 1/4 cup of the warmed nutella down the centre. Swirl with a butter knife. Add the rest of the batter overtop of the nutella. Then spread another 1/4 cup of the nutella on the top. Swirl with a butter knife, mixing the batter with the nutella. Bake in the oven for about 1 hour, until a cake tester comes out clean. Let it cool in the loaf tins for about 10 minutes. Then remove from the loaf tins and cool on a rack. These loaves freeze very well. If freezing, use within 3 minths. I have been wanting to make alfajores cookies for a very long time. Their common description of being a melt-in-the-mouth cookie sandwiched together with dulce de leche just seemed heavenly. And they are. Alfajores Cookies are one of the simplest cookies to make. They are made from just a handful of ingredients; flour, cornstarch, butter, sugar and egg. And they are ready in a jiffy. The first batch I made was a regular cookie with dulce de leche inbetween. But with Valentine’s Day coming up, I wanted a chocolate filling. I added orange zest to the cookie dough, sandwiched them together with Nutella, and Orange Nutella Alfajores were born. And I must say it is a heavenly match. You can use store-bought Nutella. Or if you have time, make your own. It’s divine. 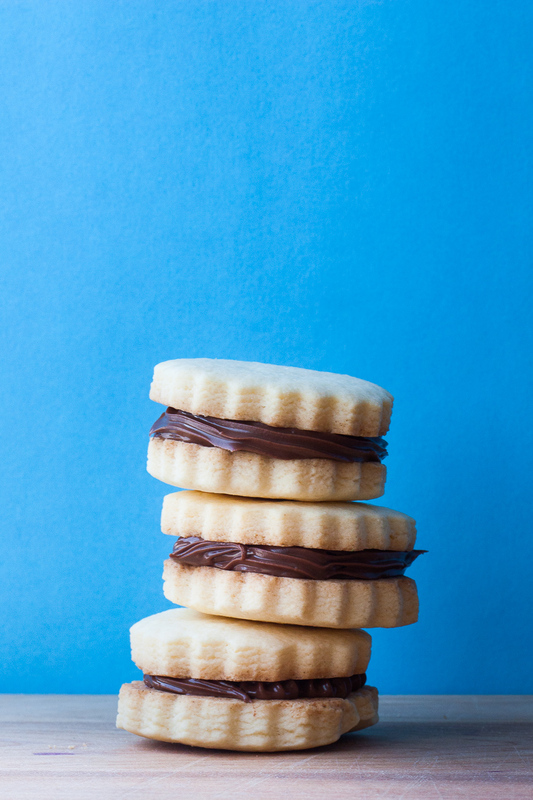 Alfajores cookies have been popular in Uruguay, Peru and Argentina since the mid 1800’s. Common fillings in alfajores are dulce de leche, chocolate mousse, fruit or cream. Toppings include meringue coating, milk chocolate, coconut or a sugar glaze. The word alfajor comes from the arabic al-hasu, which means filled or stuffed. Culinary experts have traced Alfajores to Andalusia, Spain during the occupation by the Moors. There is a strong similarity between alfajores and mamoul, a buttery confection filled with date paste that is popular in the Middle East and North Africa. Alfajores are so popular in Peru and Argentina, that there are chain restaurants that only sell alfajores. Casa del alfajor is one such chain in Peru. And Havanna, in Argentina, which has been around since 1947. Try making a batch. You will love them! Mix together flour, corn starch and baking powder and soda. Cream together butter, sugar and orange zest for 5 minutes, until pale and fluffy. Add the egg yolks and brandy to the butter mixture. Add in the flour mixture. Mix briefly until well incorporated. Roll out dough until about 1/4 inch thick. 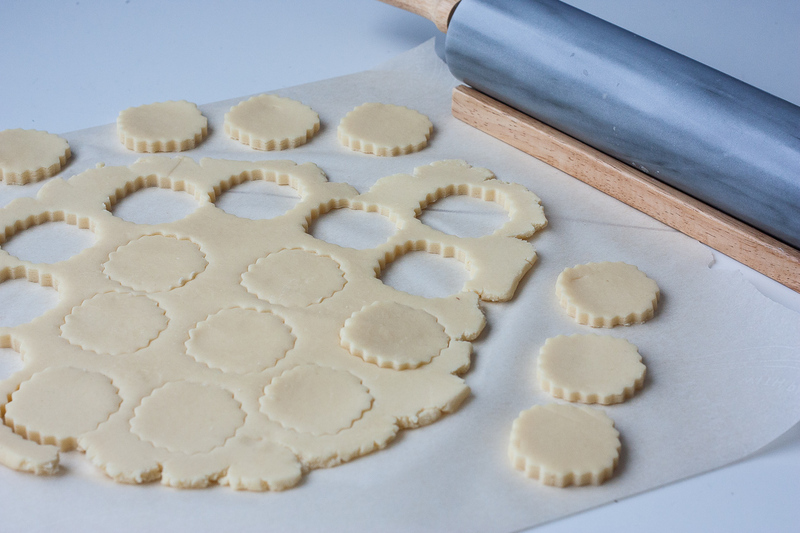 Cut out cookies with cutter about 1 1/2 inches in diameter. You can place them relatively close together, as they will not spread. Bake for about 10 minutes, only until slightly golden around the edges. 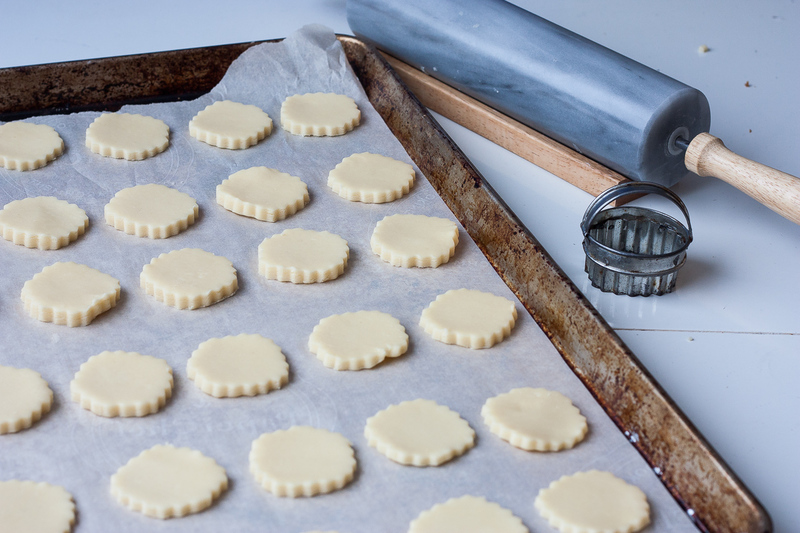 Cool on baking tray for 5 minutes, then place them on a cookie rack to cool. Sandwich them together, when they are cold, with nutella. Nutella!!! This infamous blend of chocolate and hazelnuts not only tastes amazing, but also has quite a lot of history behind it. World Nutella Day is February 5th and was created by Food blogger, Sara Rosso in 2007 to help celebrate this popular treat. She handed the reigns of World Nutella Day over to Ferroro in 2015. I have wanted to make my own chocolate hazelnut spread for quite some time now. This week seemed appropriate with World Nutella Day and Valentine’s Day so close together. I love store bought Nutella. But, like most food items, I prefer to make my own. Then, I can use the tastiest chocolate, sweeten it slightly with a small amount of local honey, and use fresh organic hazelnuts. This Nutty Chocolate Hazelnut Spread is made up roasted and skinned whole hazelnuts, dark and milk chocolate, honey, milk and milk powder. You can alter the percentage of hazelnuts to suit your taste. This recipe contains 26% hazelnuts, Nutella contains about 13% and some places in Italy use as much as 50% hazelnuts. So, you can make it as nutty as you like. If you find hazelnuts too strong, you can substitute part of them with skinned almonds, or macadamia nuts. Make sure you remove the skin from the hazelnuts and/or almonds. It’s not imperative to remove all of the skins, but try to get as much off as possible, as the skins will add a bitter taste. When you put your nuts in your food processor, try to grind them as find as possible. 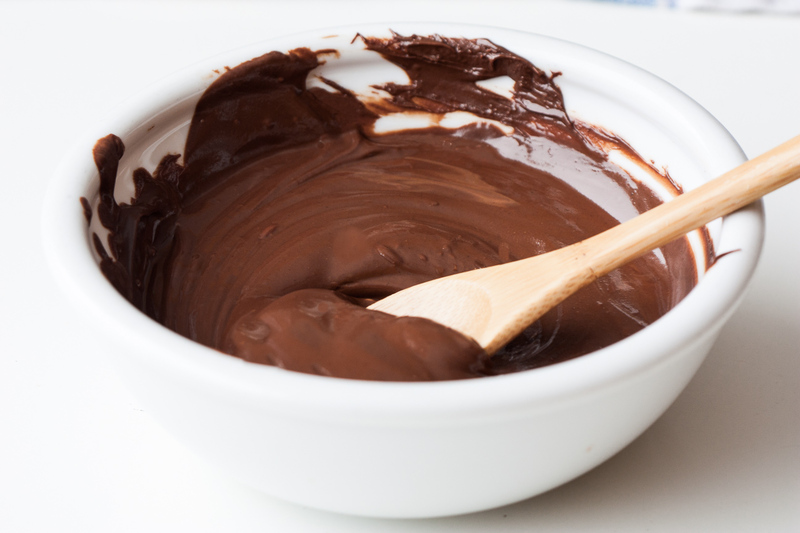 Homemade nutella will not be as fine as store bought. But you will really be able to taste the roasted nuts and heavenly chocolate. That’s the joy of homemade! This Nutty Hazelnut and Chocolate Spread is a blend of dark and milk chocolate. As long as the total weight is the same, you can adjust the amounts of each chocolate to suit yourself. This Nutty Chocolate Hazelnut Spread has some nice small chunks of hazelnut in each bite. So nutty! Besides being so amazingly tasty, the combination of hazelnuts and chocolate has an amazing history. In Italy, the combination of chocolate and hazelnuts is called Gianduja. Gianduja was created over 200 years ago during Napoleon’s regency in Turin Italy, in the Piedmont area. In 1806, Napoleon imposed the Continental System, which prevented British goods from entering European harbours under French control. This created a shortage in cocoa, which was devastating to chocolatiers. In Turin, a chocolatier, whose chocolate supplies were low, began mixing his chocolate with ground hazelnuts, which are plentiful in this area of Italy. The name Gianduja is a named after a popular Carnival marionette that is an archetype of the Piedmontese. 150 years after this crazy time for chocolate lovers, chocolate became expensive and scarce again due to the rationing in Europe during World War II. Pietro Ferrero was a pastry maker in Italy and in 1946 created Pasta Gianduja. His original version was formed into a loaf which was sliced and eaten on bread. In 1949, he accidentally added cocoa butter, which made it soft and easy to spread. It was renamed Nutella in 1964. 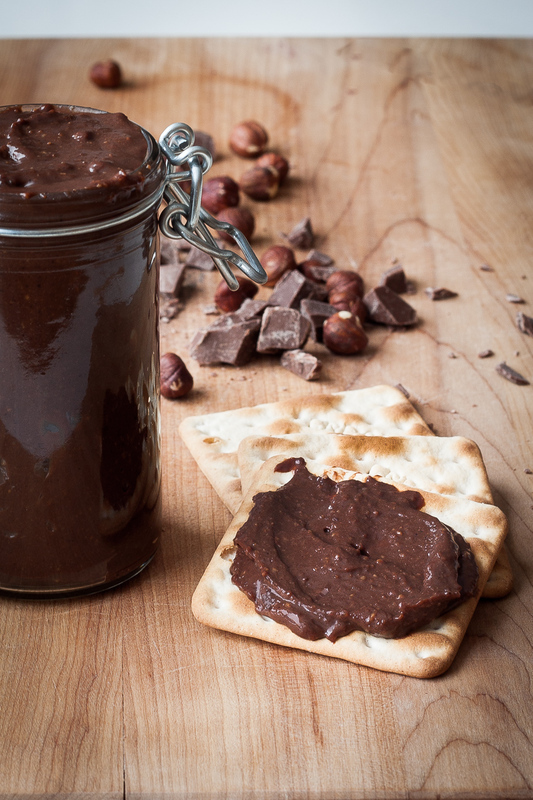 This Nutty Chocolate Hazelnut Spread is so easy to make. All you need to do is roast and grind some hazelnuts, melt some chocolate, heat some milk mixed with powdered milk and honey and then blend them all together. Store-bought nutella, is nice, but we really love our homemade verson. It is nuttier, darker and less sweet than store bought. You can adjust the percentage of nuts, as well as the type of chocolate used. You will never get the hazelnuts as pureed and smooth as in store bought nutella, but we prefer the crunchy texture. Roast hazelnuts for about 10 minutes, do not burn. When they are fragrant and the skins seem loose, they are ready to take out. 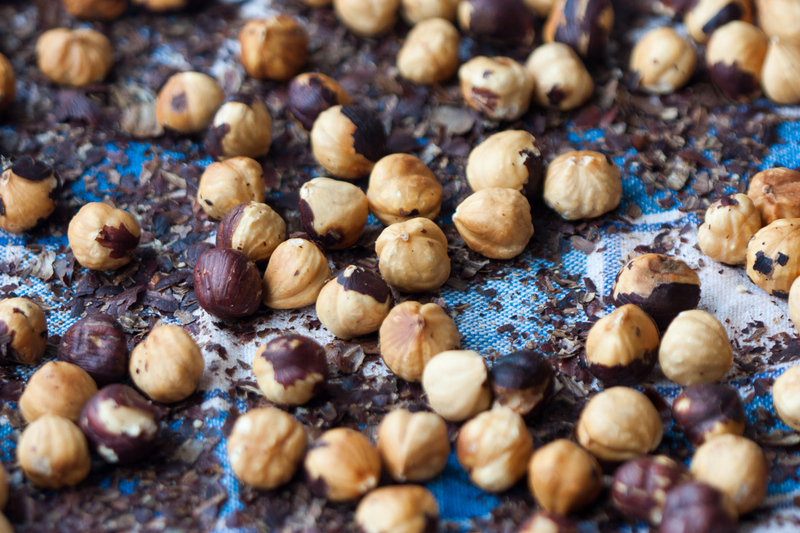 Rub the warm hazelnuts in a clean tea towel, until most of the skins have rubbed off. Add the hazelnuts to the food processor and grind until fine. Warm the milk with the honey and powdered milk. Melt the chocolate in the microwave. I melted it at 30 second internals, stirring in between. Do not overheat, or it will burn and you will not be able to use it. Add the warm milk, and chocolate to the hazelnuts in the food processor. Combine until everything is mixed together. Scrape into a clean container. Keep in the refrigerator for one week.